- Helps you tailor your strategies in the key areas of communication & interaction, cognition & learning, social, emotional & mental health and sensory and/or physical needs. 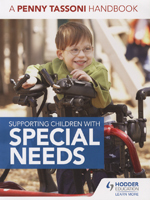 - Includes a detailed reference section on a wide range of specific needs from autism spectrum condition through to Fragile X. - Uses colourful design and illustrative photos which make theory easy to understand and to put into practice in real world scenarios. - Written in Penny Tassoni's easy-to-read, informative and practical style.